There’s no denying it: Winter is here, and with it comes varying temperatures and quick switches from dry to wet. Combine that with the extra pressure and stress that is the holiday season (and the hazards of working in an office where coworkers’ sneezing and coughing can happen every five minutes) and we’ve got a breeding ground for illness. Colds, flus, stuffy noses and infections are not only incredibly annoying, but they can also be hard to shake when the weather won’t cooperate and your event calendar is chock-full. To treat anything from a slight sniffle to a full-blown flu, sleep should be your first defense, but sometimes you need to reach for something for immediate relief (or to help you sleep). 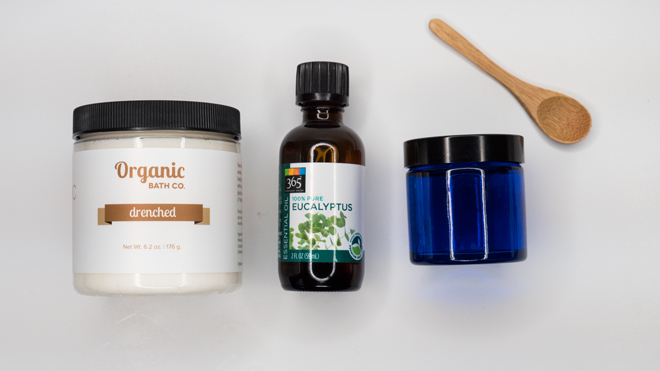 Enter the DIY Easy Breathing Treatment, a natural, more healthy alternative to traditional chest salves. Why should you avoid stopping at the drugstore to snag a pre-made jar off the shelves? The biggest concern is its petroleum base. Petroleum, which is found in many cosmetics from mascara to lip balm and makeup to moisturizers, can actually suffocate your skin. It creates a sealed barrier on top of your skin that can clog pores and eventually causes irritation and dryness. Petroleum and its derivatives have also been linked to breast cancer and signs of ADHD. In the European Union’s cosmetics regulations (which are much stricter than ours—they ban or restrict more than 1300 ingredients, while we only raise red flags about 11 ingredients), petroleum is classified as toxic and harmful to humans and animals, as well as the environment. So what can you use instead? With a few natural ingredients, you can easily make your own chest rub to combat colds, clear lungs and breathe easier. Organic Bath Co.’s Drenched Body Butter: This uber-moisturizing treatment is filled with healthy skin must-haves. 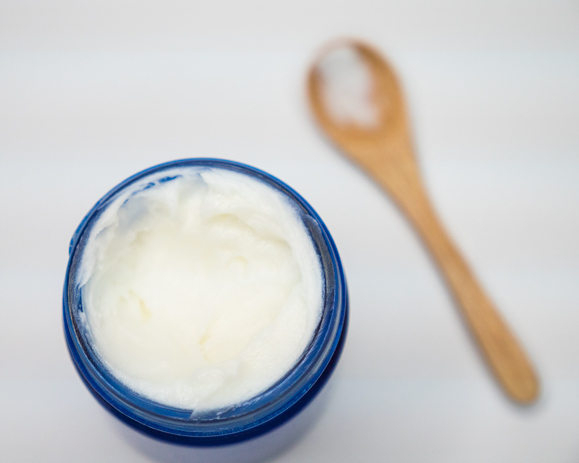 Shea butter soothes and hydrates parched, dry, flaky or irritated skin. Almond oil adds vitamin E, an emollient that helps skin look and feel smoother and more plump; jojoba oil, which closely resembles skin’s own natural sebum, penetrates deeply into pores, helping boost from the inside out. For an even more calming effect, try OBC’s Stress Less Body Butter, which carries all the same benefits as Drenched, but adds the power of lavender essential oil, which lifts your mood, helps you sleep and de-stresses. Organic eucalyptus essential oil (you can buy a bottle at your local Whole Foods or natural foods store—try to spring for the organic if you can, as the potency and lack of pesticides will only benefit you): Eucalyptus oil is fabulous at helping to combat illness for many reasons. It’s antiseptic, meaning that it not only fights infections, but it also is effective at preventing them from developing initially. It’s also antiviral, antibacterial and a decongestant, which makes it effective at treating build up in the lungs and chest, as well as in the nose and sinuses. When applied topically, its aroma and vapors cause blood vessels to dilate, allowing more oxygen to get to your lungs and making it easier to breathe. Eucalyptus is also very cooling in nature. This means it’s powerful against fevers when applied to the chest and back (or misted around your head after being diluted in distilled water). It also reduces inflammation and relieves pain when applied to skin. 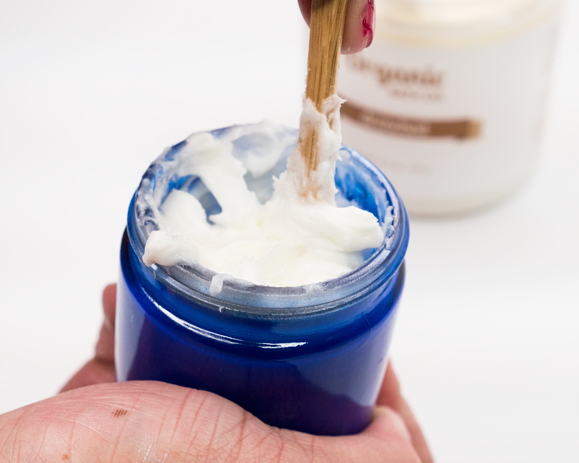 Scoop 1 cup of Drenched, Stress Less or another shea-butter-based body lotion into your 4-ounce jar. 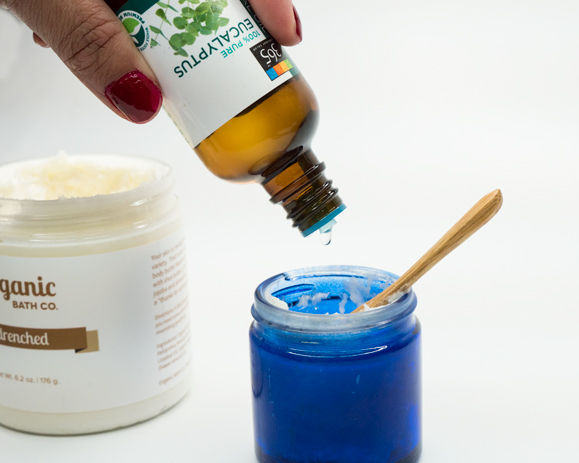 Drip 15 to 20 drops of eucalyptus essential oil into the lotion and mix with a clean, disinfected spoon. Stir the oil into the body butter. Rub onto chest, back and neck when you feel a cold coming on or when you need relief from inflammation, congestion or stress. What natural remedies do you use when you’re sick?